Fish Origin: La Plata river in southeast Brazil. Sexing: Males tend to be smaller and skinnier, while the females are larger and rounder. Cory Cats are very social fish and exhibit more personality when kept in shoals of 5 or more. Since they are omnivores, the Albino Cory will generally eat all kinds of live, fresh, and flake foods. To keep a good balance give them a high quality sinking pellet or flake food everyday. Feed brine shrimp (either live or frozen) or blood worms as a treat. 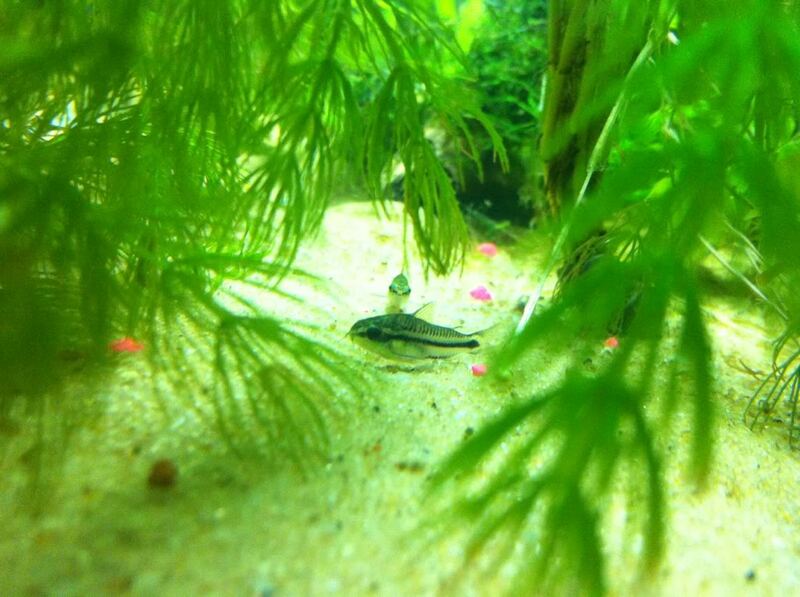 The Corydorus have a very interesting breeding routine. After bumping the male on the vent, the female will receive the males sperm into her mouth. She then discharges a few eggs which she catches and clasps with her ventral fins. Then the female will swim around and deposit a bit of sperm and just a few eggs at a time in select spots, such as a strong plant, the heater tube or ever the aquarium glass. When she has runs out of sperm, she will go back to the male and repeat the process until the spawn is complete. Aquarium size: Ideally 5ft Minimum, juveniles can be kept in a 4ft. The common pleco is a very common species sold readily in may fish stores, you buy them at their little 2-3 inch size and they die. That’s because these fish require a large tank to thrive, when their young their fantastic cleaners, as they age they become territorial and lazy. 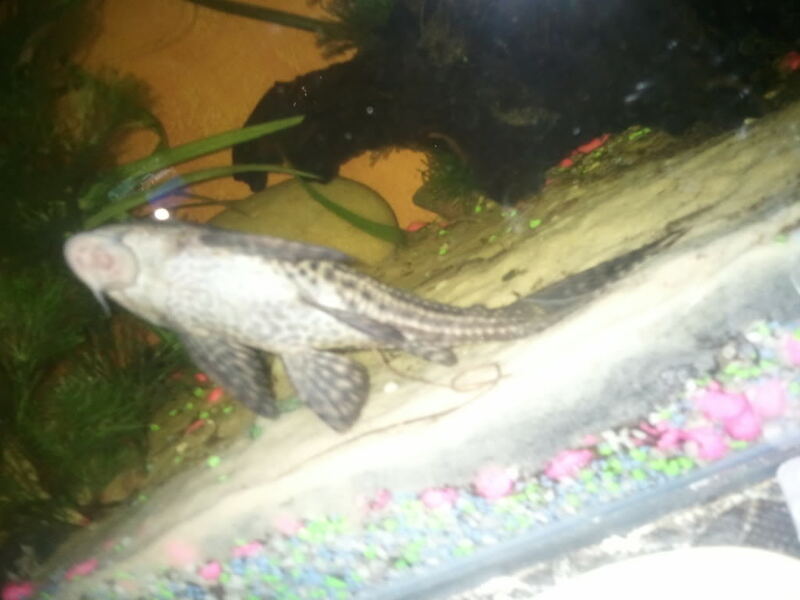 Do not underestimate a common pleco, they can defend themselves pretty well against other inhabitants. messy fish, that leaves loads of waste. They are nocturnal so its best to feed when lights out, although they may come out for food in the day. Minimum group suggestion – preferably 6 as in anything less they usually will not act regularly, meaning that they will bunch together and become very lethargic. Minimum tank suggestion – at least a 12-15 inch 10 gallon tank as they are very active and like longer tanks, opposed to shorter, higher tanks. Notes – this fish is a somewhat fragile fish. in my experience ive had 1 die for every 2 water changes missed, this is also a fish that is intolerant of salt, chemicals and sometimes even medications. Usually you know whan your fish is being affected when it shows these signs of stress, rapid breathing, less coloration, becoming very lethargic for prolonged periods of times. This is usually why they aren’t the best choice for newly set up tanks or tank that often have temperature, or water chemistry fluctuations. When your fish shows signs of these symptoms, you should immediately do a water change of 40% or more, then test your water.